Over the past ten years, the number of vegans has increased by a staggering 360%, rising to 542,000 in the UK (according to the Vegan Society). 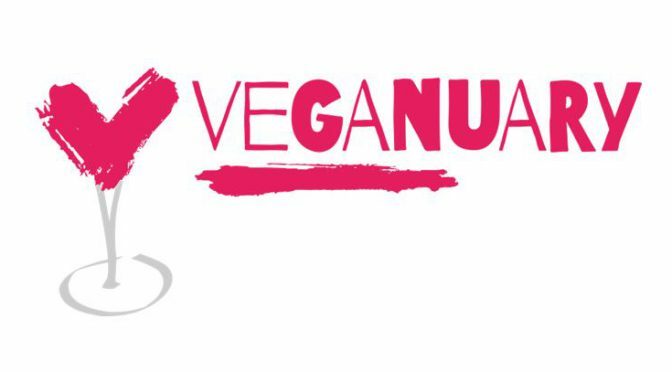 For many, the inspiration to go vegan stems from completing the popular ‘Veganuary’ challenge. The Veganuary trend is growing more and more every year, with 2018 proving to be a record-breaking year with more than 120,000 people signing up to follow a fully plant-based diet for a month. Seen as a few of the Hallgarten team have signed up and are well on their way to completing Veganuary, we thought we would help them out with a few vegan wine pairing suggestions (and help them also complete Tryanuary – see previous blog). Each of these wines are suitable for vegans, having been made using alternative filtration methods. A bright and fine example of Grecanico Dorato, with a distinctive minerality combined with wild mountain fruits, citrus characters and a hint of pineapple. Dry, with a balanced acidity, this elegant and harmonious wine has a lovely lingering finish. 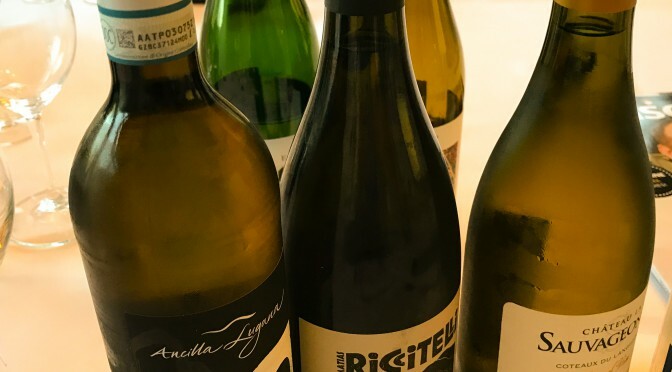 This wine from a small, boutique winery on the north-western slopes of Mount Etna is a perfect pairing for all vegan food, including a wild mushroom risotto. A dry Riesling with hints of lime blossom and elderflower. Steely with an uplifting peppery finish. This New World style is from Murrumbateman in the Canberra Wine District, where they make refined wines that are produced from some of Australia’s highest vineyards. The unique combination of altitude and some of the world’s oldest soils, which were formed over 400 million years ago. The dry style of this Riesling with good acidity makes it a perfect pairing to cut through the spice of a vegan Thai salad. The small amount of residual sugar (0.8g) in the wine is ideal for when you eat something spicy as the sugar goes to the background and the fruit comes forward. What better pairing that a vegan Indian wine, with a vegan Indian curry? This light, but elegantly oaky wine provides the perfect fusion of acidity, with a natural impression of fruit sweetness and elegant tannins. Perfect to cut through a spicy dish. 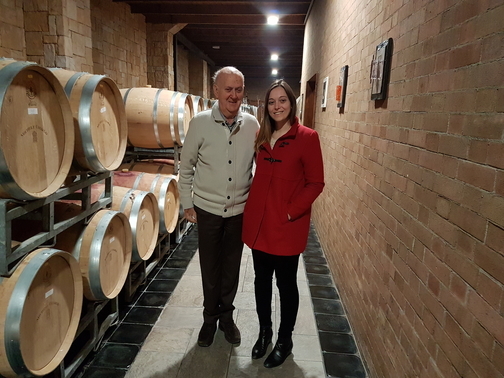 The viticultural and winemaking expertise has been provided by Piero Masi, a master winemaker from Tuscany and creator of the famous ‘Chianti Classico Casa Sola’. The modern winery located in Akluj, in the Solapur district follows Italian traditions to showcase the team’s passion. A fabulous, restrained Grüner Veltliner with apple and lime characters combined with white pepper, cardamom and spicy minerality. This balanced and refreshing wine makes it a perfect combination with a simple vegan dish packed full of flavour. Johann is carving out a formidable reputation for concentrated, mineral laden white wines. The production from his five hectares of hillside vineyard in the Spitzer Valley is miniscule, but despite this his prices remain really competitive. For a full list of our vegan wines, contact your account manager. 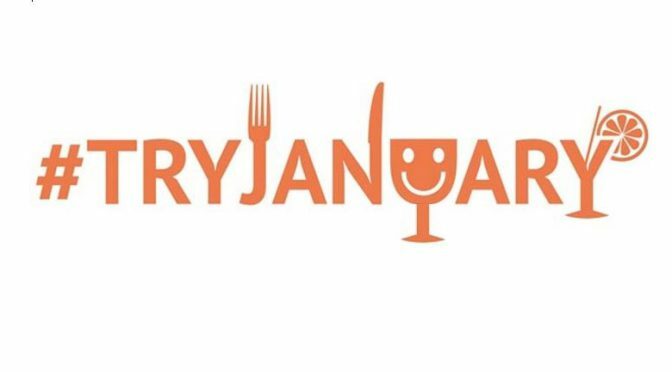 This year we are celebrating #TryJanuary – a time of the year when you when serve something new and exciting, which will entice customers in to try something new! Here are a few suggestions from the Hallgarten portfolio that are guaranteed to get rid of the January blues. Laissez Faire means “let it be” and this is reflected in the hands-off approach of winemaking. As the name suggests, the grapes selected for this Field Blend were harvested at the same time and blended in the field. The fruit was gently destemmed, then the parcels were allowed to ferment naturally on their skins for a period of five days. No additives, sulphites, acids or enzymes were added during the vinification of this blend, with only minimal sulphur added at bottling. Resulting in a floral blend with an exotic yet fresh cacophony of passion fruit, rose petal and lychee. A gentle hint of oak adds texture and weight to the long finish. Try this wine at the Australian Day Tasting 2018. Saint Clair founders, Neal and Judy Ibbotson were pioneers in the Marlborough wine industry, first planting vineyards in the valley in 1978 and then establishing Saint Clair Family Estate in 1994. They own 160 hectares of vineyard in 10 different Marlborough locations chosen specifically for the attributes of their individual “terroir” and ability to produce top quality grapes. This Pinot Noir has aromas of ripe dark forest fruits which are complemented by hints of cedar and dark roasted coffee oak. Rich, with a velvety structure and fine grained silky tannins; this is a delicious full-bodied Pinot Noir. Try this wine at the Flavours of New Zealand Tasting. The first members of the noble Stutt family in France came from Scotland in the fifteenth century to help the future King Charles VII of France during the Hundred Years War. In 1586, by way of marriage, the family inherited Château de Tracy. The Chateau is still family owned and cultivated today under the leadership of the Comte Henry d’Estutt d’Assay. An organic approach to viticulture is followed but the Château is not certified as being organic. No pesticides are used, yields are kept very low and strict canopy management is used. Fratelli means ‘brothers’ in Italian and three sets of brothers from Italy and India have combined their passion and desire to produce wines made in India, following Italian traditions. Their passion, love and hard work have resulted in the creation of Fratelli Wines, a modern winery located in Akluj in the Solapur district. 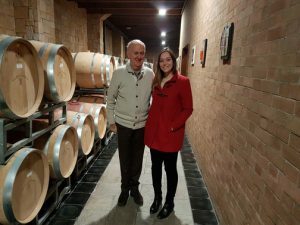 The viticultural and winemaking expertise has been provided by Piero Masi, a master winemaker from Tuscany and creator of the famous ‘Chianti Classico Casa Sola’. This blend of 70% Sangiovese, 30% Cabernet Sauvignon, displays supple ripe flavours of plum and blackberry, accented with notes of spice and vanilla, with hints of blackcurrant and cherry. Exquisitely balanced, this blend has a lush, round mouthfeel and a long, lingering finish. Perfect with a spicy curry on a cold January evening! One of the top scoring entries in Decanter’s Top 75 wines of 2017, The Single Block Barba Yiannis is named in honour of Mr Yiannis, from whom the block was purchased in 1994. The vineyard is located in Amyndeo, in the region of Macedonia. The vines are ungrafted, pre-phylloxera bush vines which are over 90 years old. The summers are hot, so in order to avoid extreme water deficit a “root zone drying irrigation” is used, to ensure the optimum conditions for the nourishment and maturation of the grapes. This wine shows a complex and typical Xinomavro, showing aromas of smoky black fruits, strawberries, dark cherries, liquorice, sundried tomatoes, and delicate spice. Full bodied and structured on the palate, with a rich depth of fruit, concentrated savoury notes and a touch of oak. The velvety tannins lead through to a persistent and aromatic finish. So obviously we got lost. “I think it’s down here,” I say. I edge the car forward down a steep hill – and then the fun starts. I career down the ice. There’s a solid brick wall on one side. A vineyard on the other. I try to steer the car into the vineyard: softer landing. It is at this point that Gen shows her class. Five yards later we hit a dry patch and the car skids to a halt. And we breathe again. Thankfully, the rest of the trip is much less eventful and a lot more fun. After somehow managing to get the car out of the vineyard, we eventually find the Chiarlo guest house and meet up with Stefano and Erica for a bite to eat and a catch-up. Cipressi 2015 (the second vintage to be made under the new Nizza DOCG) – looks spectacular. On the nose you get hugely perfumed blackberries, massive and profound. On the palate: lovely, grippy, sappy tannins. Mouth filling, a touch of savoury now begins to assert. Huge finish which goes on forever. Cerequio 2013 – refined and elegant nose, loganberries, cranberries, exotic fruit. A touch of boot polish. Tannins are firm but not harsh, coating rather than dominating. A touch of bacon sandwich on the finish, but very soft and smooth and classy. Needs at least another two years. The following morning we drive to the winery, gorgeous snowy vistas every side of us. At the winery a sprightly Michele welcomes us, proudly showing us through the fermentation and barrel rooms, before making Gen’s day by posing with her for photographs. 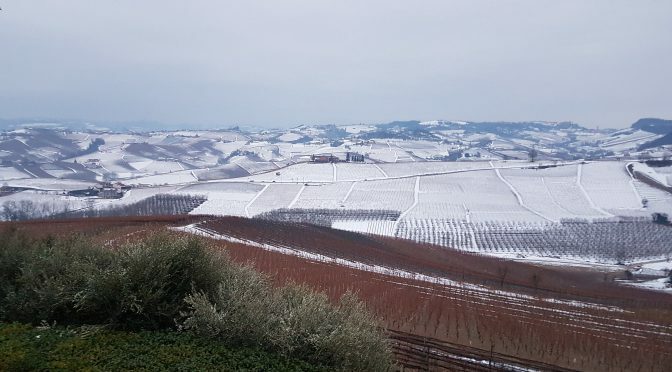 The 82 year-old, who still works at the winery every day, tells us the ’17 vintage will be short on volume but good in terms of quality – especially for Barolo. I cross my fingers and hope Gen doesn’t volunteer that I almost wiped out a row of those precious Cerequio vines! 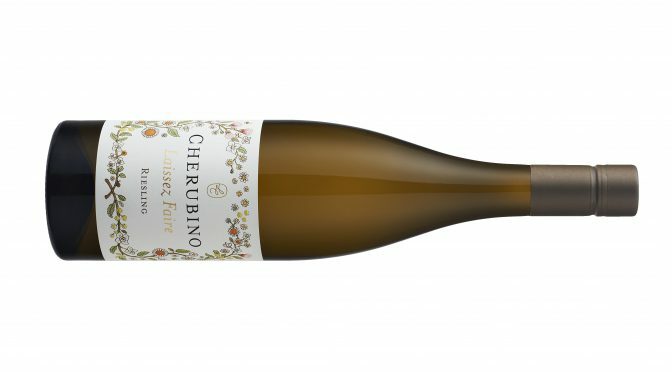 Laissez Faire Riesling 2015 is a James Halliday 95 point wine, from one of the most decorated winemakers in the world, Larry Cherubino, with a tight knit acidity lingering in the background, this is guaranteed to add zip to your January. A beautiful lemon and lime sherbet style classic Riesling. Very fresh and crisp with layers of waxy stone fruit and floral notes finishing on a lovely almost toasty note. The grapes are grown in a south facing vineyard in the Porongorup sub region, which was planted in 1998 to a density of 1800 vines per hectare. The vines’ clones are unknown, but they are on their own rootstocks. The vineyard is irrigated to achieve the optimal amount of moisture required. With a focus on natural winemaking, this is made in small batches from hand harvested grapes. The fruit was whole bunch pressed. The juice was then settled without the addition of enzymes, sulphur or acid. Once settled, it was allowed to ferment naturally at a low temperature for six weeks. Stunning with Proscuitto-wrapped tiger prawns with pickled vegetable slaw.